It has often been said that Truth is the first casualty of war as governments immediately limit the freedom of mass media. Twinned with this imposition is the increase in government propaganda and mass-advertising. At the outbreak of the Second World War there was the expected rush to the colours by both the patriotic and those who, following the Great Depression, had few options and saw the war as an opportunity for regular meals and shelter from the coming winter. 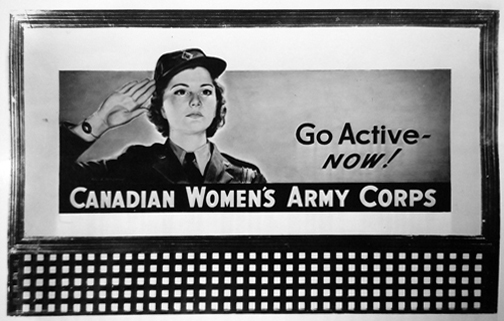 However, by 1941 the Canadian government, spurred on by the Army, was examining ways to increase recruitment. 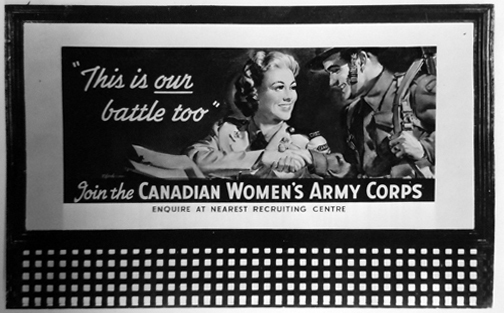 In August of that year the Canadian Women’s Army Corps (CWAC) was raised, in response to the shortage of personnel caused by the increase in the size of Canada’s military. Although hesitant at first to employ women in uniform (or what one senior army officer called a “petticoat army”) these women soon proved their worth, by assuming duties that would release men for Active Service. 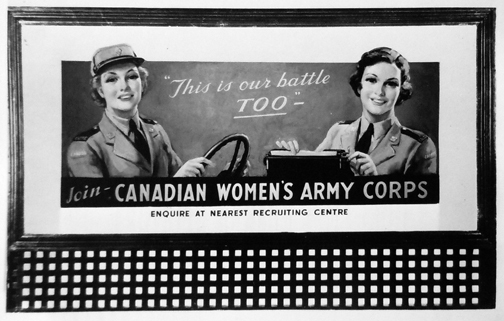 So successful was this ‘social experiment’ that the Army engaged in an advertising campaign to attract even more women. This campaign included press advertising, posters and the extended use of roadway billboards. A photograph of an actual roadside billboard. Here a female factory worker, presumably from Long Branch, offers a Lee-Enfield rifle. 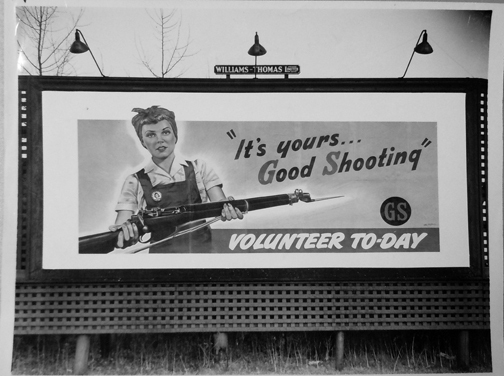 The billboard plays on the “GS” badge which represented General Service (denoting a volunteer who has indicated a willingness to serve overseas) with Good Shooting. 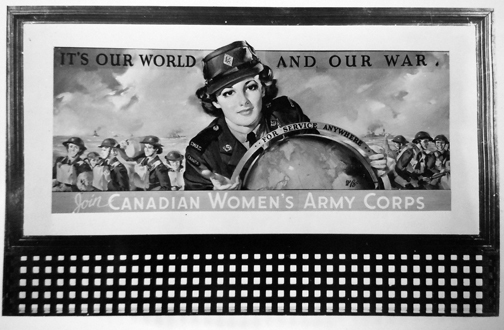 A mock-up showing the equality between men and women in uniform and indicating that both had the same motivation and goal. 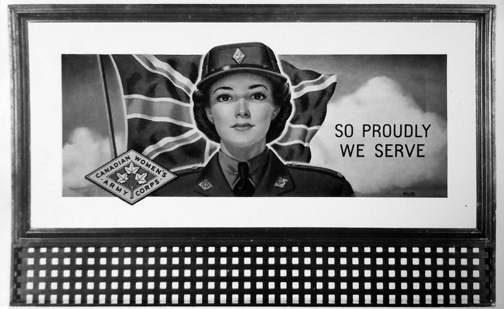 Not only did the Army wish to increase the numbers of women in uniform they also wanted them to volunteer for General Service in order to serve at locations in Great Britain and, as needed, overseas at various headquarters. This mock up has the added text ‘Enquire at Nearest Recruiting Centre’ to maintain consistency with other billboards. CWACs served in many occupations with clerical being the most common. In addition to drivers, some CWACs served in food service, instrument repair and machinery options. Short of actual combat there were many opportunities for women in uniform. Another appeal to ‘Go Active’. 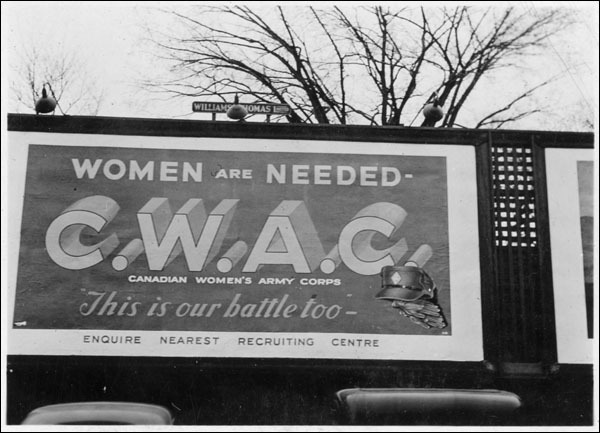 In addition to encouraging new enrollment the billboards also encouraged existing CWACs to go to the next level by volunteering for oversea duty. 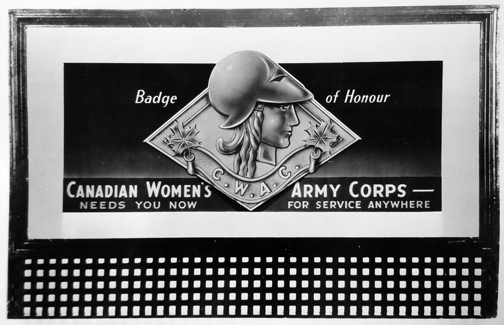 This mock up is leveraging the CWAC badge as used on the lapels of their uniform. The CWACs chose Athena, Goddess of War, as their symbol. This mock up subliminally suggests that CWACs would only serve in Canada. The use of the model as a telephone operator would comfort many potential volunteers, and their parents, who saw this occupation as one that was suitable for women. Volunteers under the age of 21 required parental approval prior to enrolling. This final mock up tugs on the patriotic heartstrings of young women. The badge is the result of an artist taking liberties with the CWAC cap badge. 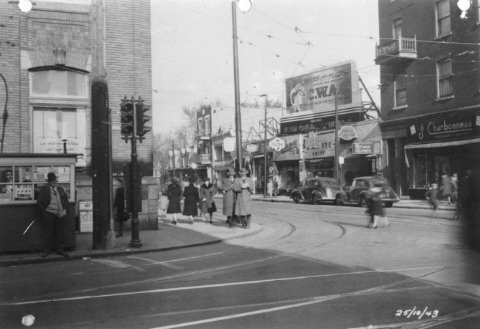 The billboards’ locations were noted limited to roadways. Here, one is placed above a shop in a town’s shopping district. Prospective recruits had to be in excellent health, at least 5 feet (152 cm) tall and 105 pounds (48 kg) (or within 10 pounds (4.5 kg) above or below the standard of weight laid down in medical tables for different heights), with no dependents, a minimum of Grade 8 education, aged 18 to 45, and a British subject, as Canadians were at that time. They were paid two-thirds of what the men were paid in the same occupation although this was later changed to four-fifths. 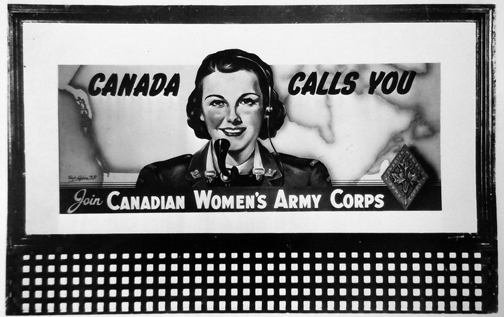 CWACs served overseas, first in 1942 in Washington, DC, and then with the Canadian Army in the United Kingdom. In 1944 CWACs served in Italy and in 1945 in northwest Europe. Following VE-Day they served with the Canadian Army Occupation Force (CAOF) in Germany. 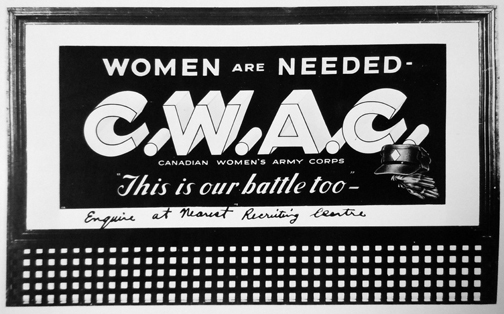 Approximately 22,000 women served in the CWACs and, of these, 3,000 served overseas. In August 1946 the CWACs were disbanded.